To conduct a highly successful "Bookcase for Every Child" project in your community, there are several key factors that must be clearly understood, implemented and monitored on a continuing basis. (1) The first factor is that your project must have its own identity and not be a part of any other literacy program. If you align yourself with adult literacy, public or private schools, colleges or universities, a particular church, civic club or other organization, you will lose your identity as a community-wide approach that is vital to your success. Here is a side note that is most important: Your master craftsman can be reimbursed for materials later, but he should build one or two sample bookcases and bring them to your first committee meeting. At the end of the meeting have someone with a digital camera take several shots of your committee members posing with the bookcases. The best photo, with everyone smiling, can be used by your local newspaper to run with an article to launch your project when the time is right. (2) The second factor is to have a commitment from one to three community leaders who will be the driving force behind this project. There are people in your community who are highly respected, are very visible and who have a real desire to improve literacy, understand how to motivate and inspire others, and who will take action and move forward when someone drops the ball. These are also the people who know and will contact other leaders about serving on the Bookcase Project Committee. (3) Forming a committee is next. 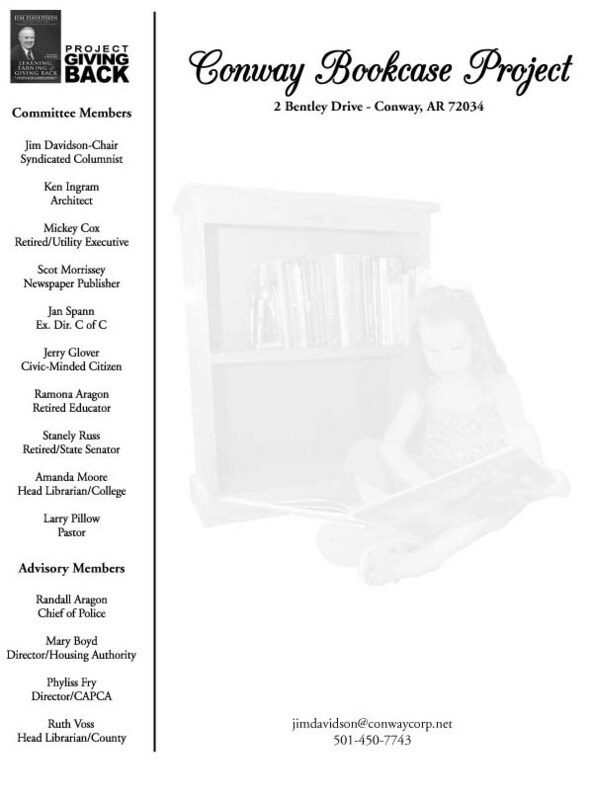 There are a number of people who should be on this committee by virtue of their position: newspaper publisher, executive director of the chamber of commerce, librarian(s) (college, county or city), executive director of the Head Start program, executive director of the Housing Authority, Mayor, Police Chief and any influential members of the political community. There are others who should also be on your committee because of their expertise such as a good craftsman, an architect, a minister, a civic-minded citizen who will do whatever is needed and others who are "hand-picked" because of their attitudes, leadership qualities, willingness to serve, and who truly care about the future of your community. With 10 to 15 of the right people on this committee you will be able to move mountains. Follow the link to our letterhead listing committee members who are involved in the Conway project to see who we recruited. To make this a community-wide effort -- which is the only way to ensure maximum success -- you should name your committee the "XXXXXXX Bookcase Project Committee" listing the name of your own city or town in this generic example. 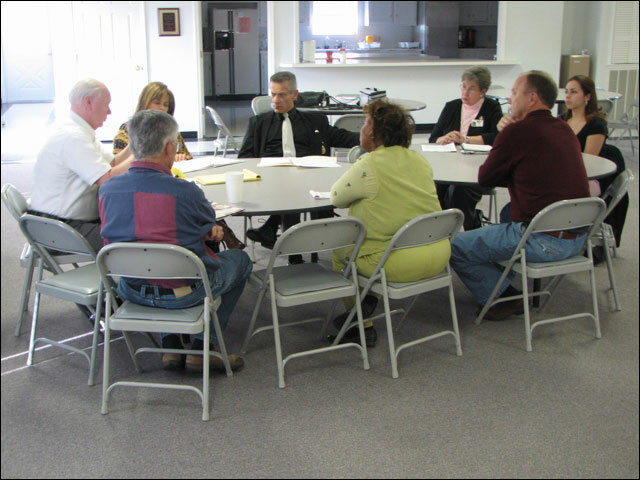 You will find your members in churches, civic clubs, politics, among retirees, and all across the community. When this process is complete, you will have a committee of great people with your own project identity, name, and a clearly-defined mission. If fact, it would be good at this point to write a good Mission Statement. Discuss what the purposes and goals of the committee are and that can be your Mission Statement. With some positive newspaper and other media coverage stating the goals and purpose of improving literacy, this will soon be common knowledge among all your citizens, especially parents who hold the key for America's long term success. (4) Hold a meeting. After your team is in place, it will be time to hold your first committee meeting. You can assure people you recruit that being on the committee won't take much time. In Conway only two committee meetings were held during the completion of the five phases of our bookcase project. The acting chairman should set a date, time, location and develop an agenda for your first meeting. Once the project is up and going, ideas, people assignments and other details can be handled by group e-mail, usually initiated by the chairman. We had our committee meetings at City Hall, with the blessing of our mayor, because this gave us credibility during the critical first stages of the project. Since we are using no tax money or federal grant money, we suggest that committee members from the public sector be non-voting advisory members, to avoid any sense of impropriety. Your acting chairman may be elected to serve as your official chairman. This should be your first order of business because the chairman will preside and provide order for the meeting. A Co-chairman should also be selected from your group to assist the chairman and to provide leadership in a number of different areas. Right away pass a pad around for each person to list his or her name, mailing address, E-mail address and all telephone numbers. This will be the official committee roster and contact information. A secretary should also volunteer to take minutes to distribute to members following the meeting, again usually by e-mail. This is especially important for those members who could not attend. Minutes also will serve as a reminder to everyone, as a history of what happened, and as a checklist of things to do. Be sure to send printed copies to members who do not have e-mail. Many of the decisions and details of the project will come into focus as time passes and more and more people get involved. There are a number of decisions that should be made at your first committee meeting. First, make sure you have identified the children in your community who need the most help since they will be the ones receiving the personalized bookcases, and the "gently used" children's books. In Conway -- and we suspect this is true all across the nation -- the children who are in our local Head Start Centers are the ones who need help the most. By federal guidelines, these children are in low-income families and many are in single-parent homes who have few, if any, books, much less a parent who has the time, ability and interest to read to them. A personalized oak bookcase, some good children's books and people reading to them each week could literally mean the difference between success and failure for many of them. Secondly, make sure you have a quality woodworking craftsman on your committee. In most cases he or she will know other craftsmen in the community that can also be enlisted to help with the project. Many craftsmen who are retired or semi-retired have great woodworking shops at their homes. In our community you would not believe the great spirit of camaraderie that has developed between our craftsmen who truly enjoy what they are doing and know they are making a difference in the lives of these children. Thirdly, if possible secure a good building location to construct the bookcases. We were fortunate to have one of our committee members, Reverend Larry Pillow, graciously commit for us to use his church's fellowship hall for this purpose. We also used this same building to store the donated books that came in during the book drive. Since we use only one side and one corner of the hall, we are not interfering with the church's activities. Your committee meetings should last only one hour because busy people will appreciate the fact that you are organized and are not wasting their time. Have an agenda (and stick to it) and the meeting will move along more smoothly. Send the agenda to committee members in advance so they can be thinking about the various topics. Near the end of the meeting, the chairman should go around the room and ask each committee member to make any comments or suggestions since everyone likes to make a contribution. The secretary should record these comments since there will be many good ideas given, which need to be remembered. During the course of the meeting, a number of different tasks should become apparent and the chairman should ask for volunteers to complete each task and report back to the committee. Some things need to be reported while others need to be done. Its important to know the difference. Give deadlines if possible since we all work better with deadlines.